A traditional ruler in Ondo State, Oba Pius Akinfesola Adewola, would spend this yuletide period in prison as a Chief Magistrate Court in the state sentenced him to two years imprisonment over allegation of fraudulent conversion, and obtaining money under false pretense. 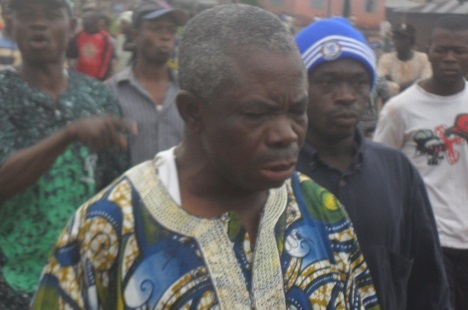 Adewola who is the traditional ruler of lgburowo Community in Odigbo Local Government Area of Ondo State was sent to prison by an Ore Chief Magistrate court. Delivering judgement on the matter, the presiding Magistrate, O. J. Adelegan, said, “from the antecedents so far garnered on the record, the convict appears to me, a conscienceless person, who has no iota of regret, indulging in such an opprobrious and despicable act”. “However, since it is no gainsaying, that our law is no respecter of any personality, I strongly deprecate the ungainly and unbecoming acquisitive conduct of the convict, particularly, his fraudulent instinct to corruptly enrich himself at the expense of others. “Though, I have listened attentively to the plea of alocutus by his counsel, but from the available record, I see him as a neophyte, I mean a first offender” “Nevertheless, I am strongly of the humble mindset, that if the convict is not appropriately sanctioned, the danger inherent therein, is that people of like minds, may either overtly be influenced or encouraged to see criminality, as a veritable means of livelihood. To this end the convict is hereby sentenced as follows” “On counts 10-21 of the charge, which are on fraudulent conversion, the convict is hereby sentenced to two years imprisonment or to pay a fine of N500,000.00 on each of the counts” “Lastly, on count 22 of the charge which is on obtaining by false pretense, the convict is also hereby sentenced to two years imprisonment or to pay a fine of N500,000.00, respectively. “In all, both fines and sentences are ordered to run concurrently. The monetary exhibit in this case, which is N408,000.00 is further hereby ordered to be returned to Igburowo community forthwith” he stated. Shortly after the judgement, counsel to the Ondo State Government who represent the Attorney-General and Commissioner for Justice, Mrs. Bola Joel Ogundadegbe, commended the Magistrate for what she described as erudite judgment and the wealth of knowledge put in place during the cost of interrogations. It could be recall that the monarch was accused of short changing traditional chiefs in the community by refusing to pay them their entitlement in full after collecting same from the local government. The community also accused him of engaging in brawl with his chiefs, illegal conversion of the community resources to personal use and writing of fictitious petitions and institution of several court cases against his subjects. The state government went ahead to suspend him and directed him to stop parading himself as the Akamuja of Igburowo land. He was arrested and detained by the police before he was subsequently arraigned in the court on thirty six count-charge of stealing, fraud, illegal conversion of the monthly salaries of his domestic workers and Chiefs, false declaration and impersonation.